All job scheduling in ServiceM8 is done through the Dispatch Board. To manage your job schedules, you have the choice to use either the calendar view, or the staff schedule view - it just depends on which you feel more comfortable using. On the right-hand side of the dispatch board is the Job List. The job list will show all your current jobs, and jobs that have just been completed. 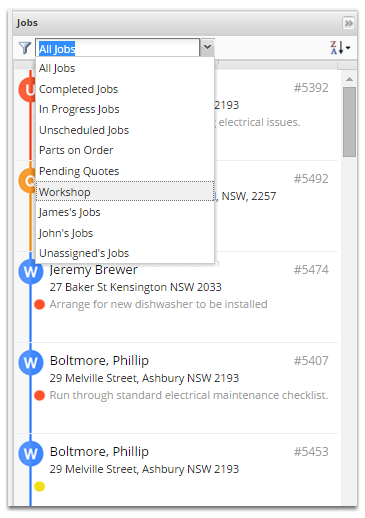 At the top of the job list is the job filters drop-down. Because you may have many jobs on-the-go at any time, you can use this to show just the jobs your currently interested in. Let's start by selecting the Unscheduled Jobs list. This will show you all current jobs which have not yet been scheduled (or they were scheduled, but the booking has now past and further action is required). To schedule any job from the list, simply drag it onto the schedule at the appropriate time & date. 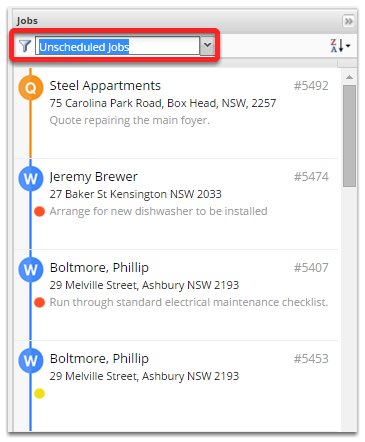 As soon as you have dragged the job onto the schedule, you will notice that the job now disappears from the Unscheduled Jobs list - because you've just scheduled it. By default, the booking will be made for 1 hour, if you need to reduce or extend this booking, grab the right-hand-side of the booking and drag it longer or shorter. If you would like to bring up more information about a booking, double click on it. From here, you can open the job to see the job diary and other client and job details. Ok great, so you've just scheduled the job to a staff member, so how can you allocate an additional staff member when the job has disappeared from the job list? Simple. You need to change the job list to find the job again, because the job is now scheduled, it will appear in the In Progress list, and as always it will appear in the All Jobs list. 3. You're done. You can schedule the job as many times as you need to from here, to the same staff (Maybe they are quoting this week, and your tentatively booking the work in for the following week), or to different staff (You might have a quoting team and a work team who need to both be allocated). 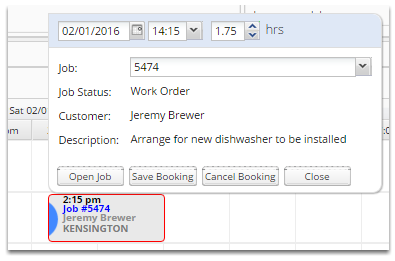 For more advanced users, learn about how to use Queues to manage jobs on hold, and about creating your own customised job filters for even greater control over your jobs.